The White House and private-sector leaders announced ambitious new actions yesterday to reduce emissions from hydrofluorocarbons (HFCs), greenhouse gases commonly used as refrigerants that are as much as 12,000 more potent than carbon dioxide. These new commitments, combined with existing HFC-reduction initiatives, are expected to cut global greenhouse gases by the equivalent of more than 1 billion metric tons of CO2 cumulatively by 2025, as much as would be achieved by taking 210 million cars off the road for one year. HFCs may not get as much attention as carbon dioxide, but regulating them is an important sign of progress. In 2013, HFCs accounted for 2.4 percent of total U.S. GHG emissions, but their use is expected to grow rapidly in the coming years. Addressing HFC leakage from existing sources checks off another “step” on the 10 point action plan the United States could take to achieve its target of reducing emissions 26-28 percent below 2005 levels by 2025. EPA proposed a rule that will extend the servicing and disposal of air conditioning and refrigeration equipment requirements for other ozone-depleting substances (like chlorofluorocarbons and hydrochlorofluorocarbon) to HFCs. Like we mentioned in last year’s Seeing is Believing: Creating a New Climate Economy in the United States, this action will help capture, reclaim and recycle more HFCs from existing equipment to reduce the amount of new HFCs produced. This is especially important because two-thirds of HFC emissions likely occur as a result of commercial refrigeration and mobile air conditioning system leaks and service practices. EPA also announced that in the first half of next year, it will propose new rules that will ban even more of the most potent HFC uses while also expanding the current list of climate-friendly alternatives. 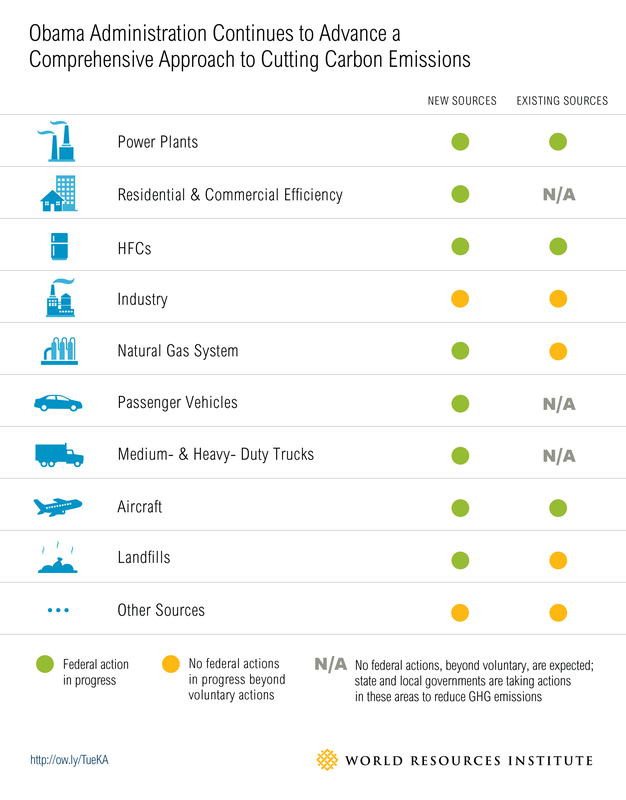 This will give industries and other users more options in how they can cut their GHG emissions. Target will eliminate HFCs from all of its stand-alone coolers in its stores (with a compressor capacity below 2,200 btu/hr) starting in January of next year—several years ahead of what EPA requires. Honeywell expects that its Solstice® line of products using climate-friendly HFC alternatives will reduce global GHG emissions by 475 million tons of carbon dioxide equivalent (CO2e) by 2025, more than one-third higher than the reductions the company projected last year. The new announcements also provide strong momentum in advance of the Meeting of the Parties to the Montreal Protocol in Dubai in early November. Here, countries will work together to amend the Montreal Protocol, an international treaty designed to protect the ozone layer, in order to establish a phase-down of HFC use globally. This could be a huge win for the climate; the White House reports that strong international action on HFCs could avoid 0.5 degrees C of warming by the end of the century. There’s still more work to be done, but progress made this week is a big step forward in preventing dangerous HFCs from entering the atmosphere, both at home and abroad.